Kapisanan Philippine Centre for Arts & Culture/Blog/On Top Of The World... but not for long? On Top Of The World... but not for long? Sorry for all the Philippines news lately, but the heated plotlines are a really great snapshot on how politics in the homeland works. I'm still breaking it down because this soap opera just keeps getting crazier. 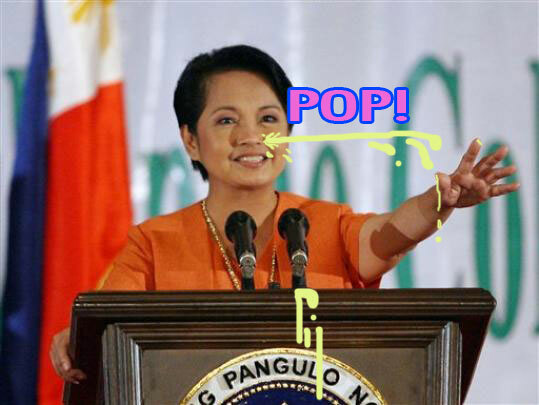 Up to her neck in hot water due to the latest scandal and in the midst of cockblocking another ousting by doing the CHA-CHA, President Arroyo's problems don't stop there -- a plot has been uncovered that targets her for an assassination attempt by Al Qaeda-affiliated terrorists. It's enough stress to make that face-mole pop. However, some Arroyo opposers are saying a communal "YEAH, RIGHT" to this news as they ask if a supposed assassination threat is coming at an all-too-opportune moment. Check the situation -- she's about to answer to another scandal accusation, calls for her resignation have flared up yet again, and there's another People Power planned for tomorrow. Isn't it just too perfect that this Al Qaeda thing come up right now? In acting, it's called 'pulling focus'. In a chase scenario, it's called 'creating a diversion'. In the US government, it's called '9/11'. (ooooh that's my conspiracy theorist comment of the day.) 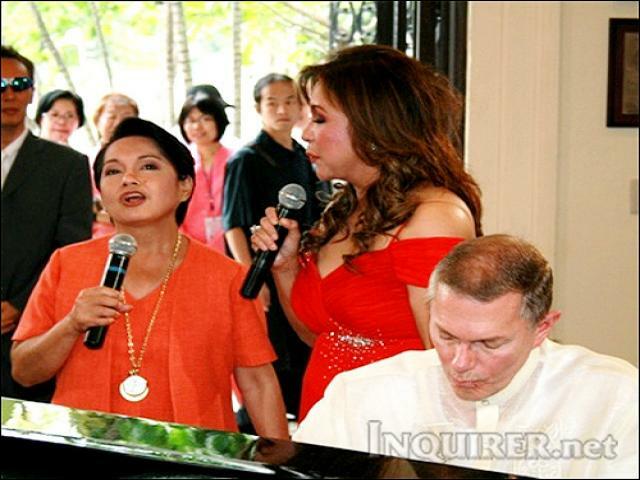 The ultimate proof that Gloria must be the one behind the assassination rumors has to be this: Despite the unrest, the danger and the threat on her life, she was relaxed enough to sing a duet with Richard Carpenter from The Carpenters, who was in the Philippines for a minute. Because when the country is in turmoil, what better thing to do than sing "Didn't You Say You'd Always Love Me Bay-Baaaay..."